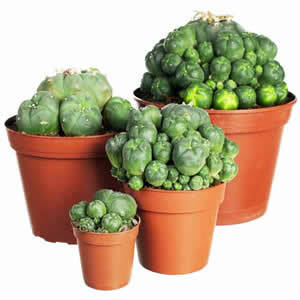 Even when used in the appropriate religious setting, peyote can present a number of health risks. As such, it is important to be aware of the potential health problems that can be caused by using peyote. The most common side effect of using peyote is nausea. This is typical of many hallucinogens, especially when such drugs are ingested by new users. Regular users of peyote report the nauseous feeling disappearing as they consume the drug more frequently. Other negative short-term effects may include weakness, shortness of breath, increased blood pressure, faster heart rate and feelings of anxiety or even terror. The worst effects of peyote occur when used in high doses. Consuming an excess of peyote can lead to a state of severe anxiety lasting as long as two days. In other cases, a high dosage of peyote may cause severe physical reaction and require the user to be hospitalized. Typically, these severe health problems occur when somebody takes a high dose of mescaline, the purest and most potent form of peyote. While the short-term effects of using peyote in lower doses are usually not serious, the l risks are, in some cases, life threatening. Those who use peyote frequently (at least twice a week) may be susceptible to hallucinogen persisting perception disorder (hppv). HPPV is also seen in frequent users of LSD, acid and other hallucinogens. The condition causes sufferers to experience flashbacks of hallucinations a long time after taking the drug. The biggest danger of HPPV is that the sufferer may experience a flashback while he or she is operating a moving vehicle or engaging in some other potentially life-threatening activity. In general, supervised use of peyote can be safe when used in moderation. Peyote does hold further potential risks in pregnant women, users with high or low blood pressure and those suffering from mental psychosis. Using peyote can be especially risky for pregnant women. The drug may cause contractions in the uterus, leading to a miscarriage or still-birth. It should also be avoided by those with high blood pressure, as the drug can cause alterations in blood pressure levels. Peyote also poses a risk when used in conjunction with certain drugs. Peyote and alcohol make a dangerous combination. This is due to pharmacological similarities in alkaloids found in peyote and those present in the brain during alcohol intoxication. Caution is also advised in patients taking blood pressure medication, as peyote has the potential to alter blood pressure levels. Patients taking immunomodulators are advised not to use peyote, as these drugs may cause a severe physical reaction if taken with peyote or mescaline. Much research has been done on the potential long-term effects of using peyote on a regular basis. This research found that most people using peyote in religious settings fail to experience any negative effects, other than occasional short-term nausea and stomach pain. The lack of lasting phsycial and mental trauama is one of the things that distinguishes peyote from other hallucinogens. However, there are a few reported cases of users developing hallucinogen persisting perception disorder (hppv). HPPV is also seen in frequent users of LSD, acid and other hallucinogens. The condition causes sufferers to experience flashbacks of hallucinations a long time after taking the drug. The biggest danger of HPPV is that the sufferer may experience a flashback while he or she is operating a moving vehicle or engaging in some other potentially life-threatening activity. Heavy users of mescaline may develop a tolerance to the drug. Although it takes a really large amount of mescaline the cause an overdose, the built-up tolerance to mescaline poses a risk in that it can be transferred over to other hallucinogens. This means that a person with a high tolerance for mescaline will also have a high tolerance for LSD and angel dust, even if he or she has never used those drugs. The biggest risk in using peyote or mescaline in recreational setting is that drugs sold on the street and billed as mescaline almost always contain other drugs, such as LSD, ecstasy and angel dust. While mescaline is not necessarily harmful in and of itself, the other drugs commonly found in mescaline tablets certainly are. "Peyote." Wellness.com - Your Guide to the Best of Health and Wellness.